I once sent a story to the Writers of the Future competition, but never heard back. Lots of other authors did though and many of the winners over the past 25 years have gone on to become well known authors. 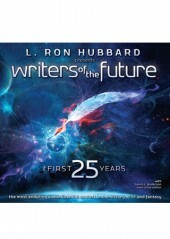 Writers Of The Future – The First 25 Years is a celebration of the successes of the competition and the stories behind it. This is a big book – a hard back almost a foot square, full of photos, interviews, quotes and anecdotes.